Nissan 3.3L VG33E, VG33ER. 1999-2002 Villager. 2000-2004 Xterra. 1997-2000 QX4. 1996-2000 Pathfinder. 1999-2004 Frontier. CONNECTING ROD. 1999-2002 Quest. Piston Rings Fit 96-04 Nissan Pathfinder Frontier Quest Infiniti QX4 3.3L VG33E. Provides better seal, improves performance, and decreases oil consumption. 50% longer life, reduced oil consumption, reduced blow by, reduced wear, reduced breakage, and reduced friction. Replace Fel-Pro Part #: 12033-0W000, 12033-7B000, 12033-7Z800. Fits 96-04 Nissan Pathfinder Frontier Infiniti 3.3 Piston Rings Set VG33E VG33ER Replace OE Part #: 12033-0W000, 12033-7B000, 12033-7Z800. Spec Note: (12 Valve) Eng. Code "VG33E". Nissan Pathfinder 3.3L 3275CC V6 SOHC. Nissan Frontier 3.3L 3275CC V6 SOHC. Nissan Xterra 3.3L 3275CC V6 SOHC. Nissan Quest 3.3L 3275CC V6 SOHC. Graphite head gasket. Quantity sold : Set of 6. Therefore all implied warranties that may apply to your part are limited to the duration of this written warranty. Each warranty gives you specific rights, and you may have other rights which vary from state to state. Pistons w/ Rings @STD fit 96-04 Infiniti QX4 Nissan Frontier Xterra 3.3 VG33E. Ultra performance premium grade aluminum alloy pistons. Minimizes fractures & cracks, no more gummed up oil and reduces engine failure. Reduce tension with better fuel economy, reduce cylinder wear. Replace Fel-Pro Part #: A2010-1W200, A2010-1W261, A2010-5S600, A2010-5S661, A2010-5S700, A2010-5S761. "DNJ Piston Ring Set --. Quantity sold : Set. Condition : New. Made with highly durable materials for lasting strength and service. Therefore all implied warranties that may apply to your part are limited to the duration of this written warranty. NPR Piston Rings Fit 97-02 Infiniti Mercury Nissan Frontier Xterra 3.3L VG33E. Provides better seal, improves performance, and decreases oil consumption. 50% longer life, reduced oil consumption, reduced blow by, reduced wear, reduced breakage, and reduced friction. Replace Fel-Pro Part #: 12033-0W000, 12033-7B000, 12033-7Z800. "DNJ Rod Bearing Set --. Quantity sold : Set of 6. Therefore all implied warranties that may apply to your part are limited to the duration of this written warranty. Each warranty gives you specific rights, and you may have other rights which vary from state to state. Pistons Main Rod Bearings Fit 96-04 Infiniti QX4 Nissan Frontier Xterra VG33E. Ultra performance premium grade aluminum alloy pistons. Minimizes fractures & cracks, no more gummed up oil and reduces engine failure. Reduce tension with better fuel economy, reduce cylinder wear. Replace Fel-Pro Part #: A2010-1W200, A2010-1W261, A2010-5S600, A2010-5S661, A2010-5S700, A2010-5S761. SOHC, DOHC / 12V, 24V / VG30E, VG30DE, VG30I, VG30DETT. 1984 ~ 1996 / 3.0L NISSAN 300ZX SOHC & DOHC 24V VG30E, VG30I, VG30DE. 1992 ~ 1994 / 3.0L INFINITI J30 DOHC 24V VG30DE. 1986 ~ 1995 / 3.0L NISSAN 200SX 2WD SOHC 12V VG30E, VG30I. Piston Rings Main Rod Bearings Fit 96-04 Infiniti Nissan Frontier 3.3 SOHC VG33E. Provides better seal, improves performance, and decreases oil consumption. Much improved design with more efficient, withstands extreme heat, reduce tension with better fuel economy, reduce cylinder wear. Replace Fel-Pro Part #: 12033-0W000, 12033-7B000, 12033-7Z800. 1999-2002 Villager. 1997-2000 QX4. 2000-2004 Xterra. 1999-2004 Frontier. 1999-2002 Quest. PISTON & RING KIT. High Alloy Steel Piston Ring set. Premium Ring Set from Japan or USA. Pistons w/ Rings @0.50mm fit 96-04 Infiniti QX4 Nissan Frontier Xterra 3.3 VG33E. Ultra performance premium grade aluminum alloy pistons. Minimizes fractures & cracks, no more gummed up oil and reduces engine failure. Reduce tension with better fuel economy, reduce cylinder wear. Replace Fel-Pro Part #: A2010-1W200, A2010-1W261, A2010-5S600, A2010-5S661, A2010-5S700, A2010-5S761. Piston Rings for 96-04 Nissan Pathfinder Frontier Quest Infiniti QX4 3.3L VG33E. Designed utilizing the latest technology, this piston ring set features premium quality and will perform better than advertised. Perfect for your vehicle and lifestyle, it is manufactured to meet or exceed stringent industry standards. Performance Part offers high-quality replacement piston ring sets from Standard to Oversizes. They will give you years of service and get you back on the road. Manufacturer Part Number: PR634.20. MPN: PR634.20. TIRE CHAINS. TIMING BELT. Tire Chains And Accessories. Timing Parts/Kits-Valve Train. Rotating Electrical. Radiators And Cooling. $PART NUMBER: SWN30120-0 96-04 NISSAN PATHFINDER / FRONTIER / QUEST / XTERRA 3.3L SOHC 12V V6 VG33E ENGINE PISTON RINGS Application 97 - 00 INFINITI QX4 V6 3.3L SOHC 12V V6 VG33E 96 - 00 NISSAN PATHFINDER V6 3.3L SOHC 12V V6 VG33E 99 - 04 NISSAN FRONTIER V6 3.3L SOHC 12V V6 VG33E 99 - 02 NISSAN QUEST V6 3.3L SOHC 12V V6 VG33E 00 - 04 NISSAN XTERRA V6 3.3L SOHC 12V V6 VG33E Package includes ---1 Complete Piston Ring Set For All Six Pistons (Standard Size) Special features ---Premium steel material piston rings ---STANDARD bore diameter 91.50 mm ---1ST RINGS SIZE 1.50MM ---2ND RINGS SIZE 1.50MM ---OIL RINGS SIZE 2.80MM ---Genuine NPR parts new in original box ---PLEASE CHECK OTHER LISTINGS IN OUR STORE FOR DIFFERENT SIZES. Spec Note: (12 Valve) Eng. Code "VG33ER". Code "VG33E". Nissan Xterra 3.3L 3275CC V6 SOHC. Nissan Frontier 3.3L 3275CC V6 SOHC. Infiniti QX4 3.3L 3275CC V6 SOHC. Nissan Pathfinder 3.3L 3275CC V6 SOHC. Spec Note: (12 Valve) Eng. Code "VG33ER". Code "VG33E". Nissan Xterra 3.3L 3275CC V6 SOHC. Nissan Pathfinder 3.3L 3275CC V6 SOHC. Nissan Frontier 3.3L 3275CC V6 SOHC. Nissan Quest 3.3L 3275CC V6 SOHC. MAHLE Original piston rings lead the industry for the latest piston ring technology. The engine types may include 3.0L 182Cu. V6 GAS SOHC Naturally Aspirated, 3.0L 2960CC 181Cu. V6 GAS DOHC Naturally Aspirated, 3.0L 2960CC 181Cu. Fits 96-04 Nissan Pathfinder Frontier Infiniti 3.3 NPR Piston Rings VG33E VG33ER Replace OE Part #: 12033-0W000, 12033-7B000, 12033-7Z800. Full Gasket Set Pistons Bearings Fit 96-04 Infiniti Nissan 3.3 SOHC VG33E . Ultra performance premium grade aluminum alloy pistons. Minimizes fractures & cracks, no more gummed up oil and reduces engine failure. Reduce tension with better fuel economy, reduce cylinder wear. Replace Part #: A2010-1W200, A2010-1W261, A2010-5S600, A2010-5S661, A2010-5S700, A2010-5S761, HS26219PT, HS26219PT-1, CS26219-1. 1997-2000 QX4. 2000-2004 Xterra. 1999-2004 Frontier. 1999-2002 Quest. PISTON & RING KIT. High alloy Steel Piston Ring set. Premium Ring Set from Japan or USA. Ring thickness. Ending Soon. - New Arrivals. - Add to Favourites. Quick Links. CARPARTSWIZ “the smart way to buy auto parts”. Accuracy (Get the right part). Here are the Top 5 Reasons Why Car Parts Wiz?. Spec Note: (12 Valve) Eng. Code "VG33E". Infiniti QX4 3.3L 3275CC V6 SOHC. Nissan Frontier 3.3L 3275CC V6 SOHC. Nissan Quest 3.3L 3275CC V6 SOHC. This pistons kit is just what you need to keep your car in good running order. Spec Note: (12 Valve) Eng. Code "VG33ER". Code "VG33E". Nissan Xterra 3.3L 3275CC V6 SOHC. Nissan Frontier 3.3L 3275CC V6 SOHC. Nissan Pathfinder 3.3L 3275CC V6 SOHC. This engine rebuild kit is just what you need to keep your car in good running order. Spec Note: (12 Valve) Eng. Code "VG33E". Infiniti QX4 3.3L 3275CC V6 SOHC. Nissan Xterra 3.3L 3275CC V6 SOHC. Nissan Pathfinder 3.3L 3275CC V6 SOHC. Nissan Frontier 3.3L 3275CC V6 SOHC. Nissan Quest 3.3L 3275CC V6 SOHC. Engine Code: VG33E VG33ER. Piston Rings. 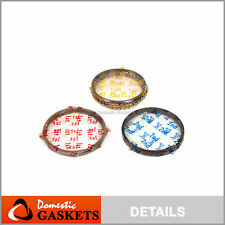 Full Gasket Set. Rush My Parts will not be responsible for any labor, towing, fluids, Freon, filters, lodging, and car or truck rental. Head Gasket Set. Lower Gasket Set. Piston Ring Set of Nissan & Infiniti 3.3 V6 Engine - Infiniti QX4 97-00 - Frontier 99-04 - Pathfinder 96-00 - Xterra 00-04 & Infiniti XQ4 97-00. Bore 91.5mm Standard 1.5x1.5x2.8mm Ring Widths. Only you can see what it costs on your end. Nissan & Infiniti VG30 & VG33 V6 Engines in 251 Nissan & Infiniti Applications. Standard Rod Bearing Set. Only you can see what it costs on your end. 1999-2002 Villager. 1997-2000 QX4. 2000-2004 Xterra. 1996-2000 Pathfinder. 1999-2004 Frontier. 1999-2002 Quest. cylinder bore 91.50mm. PISTON RING SET. DNJ P634 Std size Compl. Piston Set For 96-04 Infiniti Nissan 3.3L VG33E. Piston Rings. Rush My Parts will not be responsible for any labor, towing, fluids, Freon, filters, lodging, and car or truck rental. Manufacturer Part Number: RB616.20. MPN: RB616.20. Type: Rod Bearing Set. WHEEL BEARING. TIRE CHAINS. TIMING BELT. Tire Chains And Accessories. Timing Parts/Kits-Valve Train. 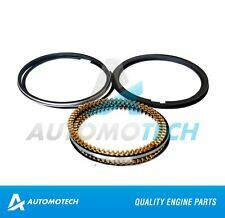 Full Gasket Set Bearings Rings Fit 96-04 Infiniti Nissan VG33E. Provides better seal, improves performance, and decreases oil consumption. Much improved design with more efficient, withstands extreme heat, reduce tension with better fuel economy, reduce cylinder wear. Replace Part #: 12033-0W000, 12033-7B000, 12033-7Z800. Piston Rings. Rush My Parts will not be responsible for any labor, towing, fluids, Freon, filters, lodging, and car or truck rental. Full Gasket Set. Valve Cover Gasket Set. Head Gasket Set. Lower Gasket Set. DNJ P634.20 o/s Compl. Piston Set For 96-04 Infiniti Nissan 3.3L P634 VG33E SOHC. Piston Rings. Rush My Parts will not be responsible for any labor, towing, fluids, Freon, filters, lodging, and car or truck rental. Spec Note: (12 Valve) Eng. Code "VG33ER". Code "VG33E". Nissan Pathfinder 3.3L 3275CC V6 SOHC. Nissan Frontier 3.3L 3275CC V6 SOHC. Nissan Xterra 3.3L 3275CC V6 SOHC. Rod Bearing Set (Standard or Oversize: . 25mm =. 010" or. 50mm =. 020"). Rod Bearings Set Size Options - Ending Soon. - New Arrivals. - Add to Favourites. Quick Links. CARPARTSWIZ “the smart way to buy auto parts”. Accuracy (Get the right part). Here are the Top 5 Reasons. Set of (6) Piston Pin Bushings in Connecting Rod for 3.0 & 3.3 Litre V6 Engines. All My Pictures are of the actual part you are buying in most cases and not a file photo. Check my feed back on E-Bay. Manufacturer Part Number: RB616.10. MPN: RB616.10. WHEEL BEARING. TIRE CHAINS. TIMING BELT. Tire Chains And Accessories. Timing Parts/Kits-Valve Train. Rotating Electrical. V6 SOHC 12V VG33E. 2000 ~ 2004 / 3.3L NISSAN FRONTIER ; V6 SOHC 12V VG33E. 1996 ~ 2000 / 3.3L NISSAN PATHFINDER ; V6 SOHC 12V VG33E. 2001 ~ 2004 / 3.3L NISSAN XTERRA ; V6 SOHC 12V VG33E. 1996 ~ 2000 / 3.3L INFINITI QX4 ; V6 SOHC 12V VG33E. FORD part number F32Z6700B. We are Human and make mistakes, If it is our mistake we will make it right. IF YOU ORDER THE WRONG PART, This does not make it DEFECTIVE. If any manufacturer warranty exists, it is between you and them. Manufacturer Part Number: PR634. MPN: PR634. Type: Piston Ring Set. TIRE CHAINS. TIMING BELT. Tire Chains And Accessories. Timing Parts/Kits-Valve Train. Rotating Electrical. Part Number: RB616. The engine types may include 3.0L 182Cu. V6 GAS SOHC Naturally Aspirated, 3.0L 2960CC 181Cu. V6 GAS DOHC Naturally Aspirated, 3.0L 2960CC 181Cu. This part fits vehicles made in the following years 1984, 1985, 1986, 1987, 1988, 1989, 1990, 1991, 1992, 1993, 1994, 1995, 1996, 1997, 1998, 1999, 2000, 2001, 2002, 2003, 2004. Manufacturer Part Number: PB616. MPN: PB616. TIRE CHAINS. TIMING BELT. Tire Chains And Accessories. Timing Parts/Kits-Valve Train. Rotating Electrical. Radiators And Cooling.